"This very tasty and easy marinade for lamb chops can also be used for steaks." Mix together the vinegar, salt, pepper, garlic, onion, and olive oil in a large resealable bag until the salt has dissolved. Add lamb, toss until coated, and marinate in refrigerator for 2 hours. Remove lamb from the marinade and leave any onions on that stick to the meat. Discard any remaining marinade. Wrap the exposed ends of the bones with aluminum foil to keep them from burning. Grill to desired doneness, about 3 minutes per side for medium. The chops may also be broiled in the oven about 5 minutes per side for medium. 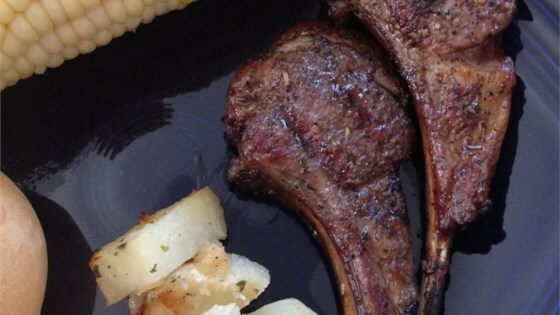 Easy recipe for lamb chops when you’re looking forward to using your grill! Very good. I made these for my son by request. I used reserved marinade to sautee mushrooms with some fresh mint and served the chops on top of them - excellent. Thanks for the recipe! A great weekday meal. Light, quick, easy, and tasty. A must try. Me and my fiancee loved this recipe!!! would definitely do it again..thanks!! Wonderful. Unfortunately the cut I bought was too fatty, but the meat itself was wonderful. I broiled everything, including all the onions. Served with the onions on top. Delicious!